The social media company added more users during the first quarter and revenue rose 18 percent, topping forecasts. The maker of Maytag, KitchenAid and other appliances beat first quarter profit forecasts as it raised prices to offset higher costs. The homebuilder beat Wall Street's profit forecasts for the first quarter on better demand for new homes. The S&P 500 index and the Nasdaq registered record closing highs after a broadbased rally on Tuesday, as a clutch of better-than-expected earnings reports eased concerns about a slowdown. The S&P has risen 17 percent so far this year, with help from a dovish Federal Reserve and hopes of a U.S.-China trade resolution as well as the upbeat start to the first-quarter earnings season. 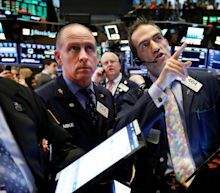 "Part of what's pushing the S&P up is a general belief it will make a new high," said Rick Meckler of Cherry Lane Investments, a family investment office in New Vernon, New Jersey, who expects that more earnings reports later in the week could push the index above its all-time high. What Drove Coca-Cola’s Volume Growth in the First Quarter? The S&P 500 index moved closer to its record high on Tuesday, as a clutch of better-than-expected earnings reports eased concerns about a slowdown, sparking a broad-based rally. The Nasdaq also climbed above its record closing high during Tuesday's session. "Part of what's pushing the S&P up is a general belief it will make a new high," said Rick Meckler, partner, Cherry Lane Investments, a family investment office in New Vernon, New Jersey who also cited better than expected earnings reports. The world's biggest beverage makers, Coca-Cola and PepsiCo Inc, are responding to shifting consumer tastes by tweaking ingredients and experimenting with new flavours that are focussed more on health conscious consumers. Chief Executive Officer James Quincey said Coke Zero Sugar sales witnessed a double-digit percentage rise, while its new orange-vanilla Coke soda was also a hit. Sales of carbonated drinks rose 1 percent, driven by strong performance of its Coke brand, while smaller, immediate consumption packages of its flavoured water and sports drinks drove a 6 percent sales increase in the business. The world's biggest beverage makers, Coca-Cola and PepsiCo Inc, are responding to shifting consumer tastes by tweaking ingredients and experimenting with new flavors that are focused more on health conscious consumers. Chief Executive Officer James Quincey said Coke Zero Sugar sales witnessed a double-digit percentage rise, while its new orange-vanilla Coke soda was also a hit. Sales of carbonated drinks rose 1 percent, driven by strong performance of its Coke brand, while smaller, immediate consumption packages of its flavored water and sports drinks drove a 6 percent sales increase in the business. Coke stock held up fairly well in 2018, as the flight to safety during the fourth-quarter selloff helped it notch small gains and outpace rival (PEP) stock (PEP) and many other staples stocks. Coke was one of a number of dividend-payers that came out on top last year, and has continued to increase its dividend payout in 2019. Coke stock has edged up 1.4% year to date, and has climbed 13.1% in the trailing 12-month period. Coca-Cola (KO) released its first-quarter financial results on April 23 before the market opened. Thanks to terrific organic sales growth and improved operating margins, the international beverage giant registered stronger-than-expected first-quarter earnings. Coca-Cola's shares rose 3.9% in the pre-market session. The Coca-Cola Co. surprised investors with a better-than-expected first quarter but cautioned that it's still expecting slower growth for the full year. Atlanta-based Coke reported net income of $1.7 billion, or 39 cents per share, up from 32 cents per share in the January-March period a year ago. Without one-time items, Coke earned 48 cents per share, beating Wall Street's expectations. posted stronger-than-expected first quarter earnings Tuesday as organic sales growth and operating margins showed solid improvements from last year. Coca-Cola said earnings for the three months ending in March came in at 48 cents per share, up 1 penny from the same period last year and 2 cents ahead of the consensus forecast, although a portion of that was related to a Brexit-linked inventory buildup in its European division. Group revenues, Coke said, rose 5% from last year to $8 billion and again beat the Street forecast of $7.9 billion thanks in part to renewed demand for carbonated drinks and new brands such as vanilla orange-flavored Coke. Nik Modi of RBC Capital Markets joins CNBC's "Closing Bell" team to talk about possible emerging themes for this earnings season. Coca-Cola CEO James Quincey joins "Squawk on the Street" after the company reported strong Q1 2019 earnings to discuss concerns over slowing global growth. Coca-Cola CEO James Quincey joins "Squawk on the Street" after the company reported strong earnings for the first quarter of 2019. Quincey says demand is still strong despite some signs of soften in the global market.